After church on Friday nights we all go over to Josh and Jelena's house to hang out and fellowship till the wee hours of the morning. The guys have been going through Romans line on line expositing the scriptures. They just made it to Romans 9. I normally am not able to stay awake to listen to the guys but tonight I did it and was so blessed by all the things I learned. A few of the guys know Greek so it's really neat to see what the original meaning of some of the words are. Lots of questions come up and the guys work through them using scripture to back up their points. We have been really blessed to be a part of Sovereign Joy Community Church (our church) and the great fellowships. Kenya's cousin Amanda sent her lots of cute clothes all the way from California. Kenya loves dresses and had a blast trying them on. but her fake one is pretty cute too! Kenya loves feeding Sadie her bottle. hard to pose she forgot to open her eyes. We had a swim party with Jake, Emily and Andrew at the Bates house. I think Kenya had more fun feeding the dogs than she did swimming! What's on your head Kenya? his Grandma didn't mind holding him! My sweet little Kenya has the most awful death stare that she will give you if she doesn't like what you say to her. For instance, if she throws her cup and you say, "Kenya please pick up your cup and put it on the table." this is the look that you will get. Or if someone new comes up to her and talks to her this is the look that they will sometimes get! Now that's my sweet girl! 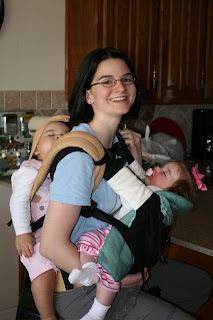 Ergo Baby Carriers,... what could be better? We were at a friends house and I couldn't get Kenya or Jadyn to go to sleep, so I put Jadyn in our Ergo and Kenya in my friend Nicole's and within 5 minutes they were both asleep! I think I was 7 weeks pregnant here so I had to sit down with them after they fell asleep. But I was able to enjoy myself with two sleeping babies! Cinderella is by far her favorite Princess! Kenya, and her princess addiction! I am mostly kidding. We went to a friends house and Kenya got to dress up in their little girls princess dresses. She had so much fun. At 20 months old she is all girl! 1st Post,...could it be twins? Well that may not happen but I will try to keep you updated on how the Delgado's are doing! So last night I was sitting on the couch and I felt three little kicks on the right side of my belly. It was so neat. I love feeling the baby move! Then much to my surprise a few hours later I felt some little kicks on the left side of my stomach. Could it be twins? Or one very active baby? We will find out in a few weeks when we have the sonogram. We have already heard the heart beat so I'm pretty sure there's just one baby but we will see. I love kids and can't wait to welcome this little one into our family!!!! 14 weeks 1 day! I can't believe this is the first picture I have taken of my belly. I will try to be better about that in the future!